Nayeem, S.A.; Rahman, M.; Rasul, G.; Khan, A.K. ; Muazzam, F.A. & Hashimoto, D.
Laparoscopic cholecystectomy which is the latest development in the field of general surgery has recently been introduced in Bangladesh. We performed this less invasive surgery successfully on two cases of cholelithiasis for the first time in Bangladesh, one in BIRDEM Hospital and another in lPGMR Hospital in December, 1991. Though for those demonstrative cases, the set–up was difficult in a new place but there was no major technical problem during the procedure. After that there was a long gap and our team has started this procedure from April, 1993 regularly at two hospitals in Dhaka. By September, 1993 we have already performed over 100 cases of laparoscopic cholecystectomy successfully. 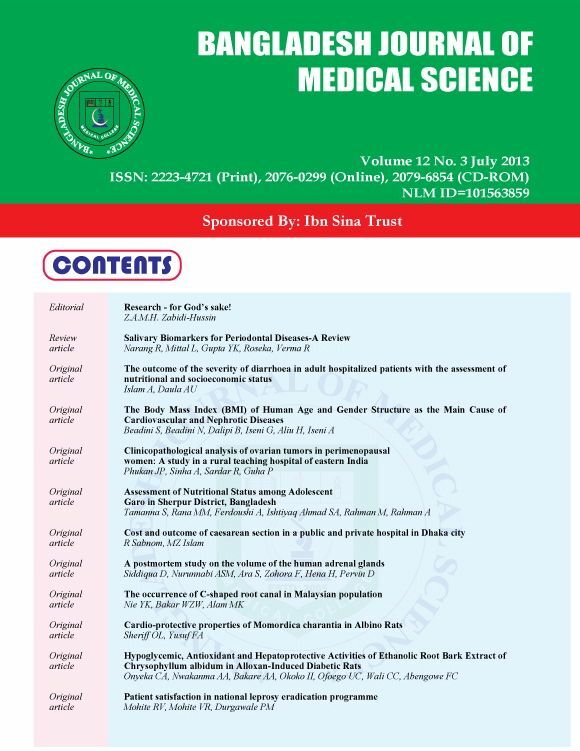 This paper will describe the patient selection, preoperative investigation, operative procedure and postoperative care of laparoscopic cholecystectomy, the newest treatment modality for gallbladder diseases.